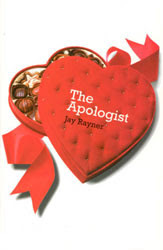 Oh, and this weekend I finished reading Jay Rayner's The Apologist. Marc Bassett has a reputation as a pitiless restaurant critic. When he writes a devastating review of a particular establishment, the chef commits suicide, roasting himself in his own fan-assisted oven, with Basset's review pasted to the door. Suddenly Basset is moved to do something he has never done before: apologize. After a series of virtuoso expressions of regret, word of Bassett's mollifying power spreads, and he is invited to become Chief Apologist for the United Nations. His job is to travel the globe in his own Gulfstream V private jet, apologizing for everything from colonialism to exploitation to slavery. It is a role that brings him fame, wealth and access to a lot of very good chocolate. But in a world overdosing on emotion, does Marc Basset really have the stomach to be the sorriest man in history? Built of delicate layers of heinous crime, forgiveness and outrageous gastronomy, Jay Rayner's glorious new novel is a piquant satire of modern appetite and etiquette.